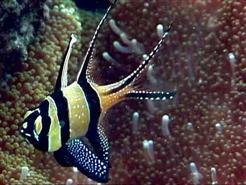 The Banggai cardinalfish has a fascinating story. Unlike most marine fish, this species produces a very small number of eggs, which the males incubate in their mouths. After hatching, the embryos remain in the parent's mouth until they complete their development. This unique species is found only in a very limited area of Indonesia. They are beautiful fish, very popular with collectors, and their small population is being over-exploited. Thanks to grants from the National Geographic Society and the American Zoo and Aquarium Association (AZA), the Center's Director of Science and Conservation Dr. Alejandro A. Vagelli has traveled to Indonesia six times in the past ten years to study the Banggai, evaluate their population, and begin to establish a conservation program. He has developed techniques for breeding this delicate species and has published numerous scientific papers on their biology and ecology. Click here to learn more. As a direct result of Dr. Vagelli's work, the Banggai cardinalfish has been assessed as endangered by the IUCN (the World Conservation Union) and included on their Red List. Click here to learn more. Scientists are working with the marine aquarium trade to help curtail the impact that this industry has had on the decimation of the Banggai cardinalfish population. Learn more about Dr. Vagelli's collaborations with other experts in the field to educate aquarium hobbyists and work toward viable solutions. View Marine Ornamentals Abstract PDF File and View MACNA 08 Presentation PDF file.